By the time this is published Brexit may well have been sorted, although that’s doubtful. 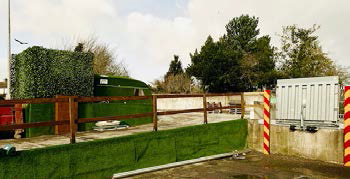 As importers of the best quality artificial grass from Holland, like many Irish businesses Grassland has used the UK as a land bridge for years. But given the impending turmoil and the new ferry from Rotterdam direct to Dublin, they have invested in a new ramp which allows them to unload containers quickly instead of using specialist 40-foot trucks. The sailing time is longer but it means their weekly deliveries arrive quicker, are more predictable and happily, are cheaper. All the better to serve their trade and domestic customers.